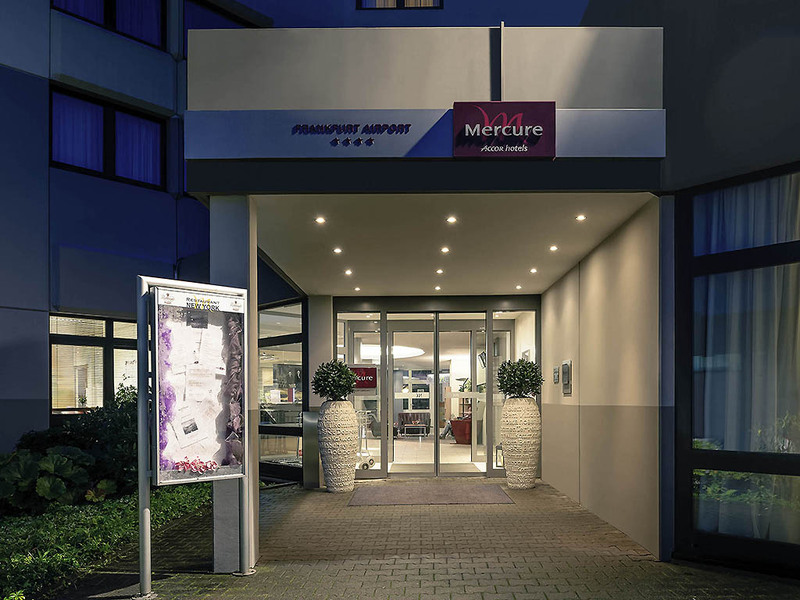 Close to Rhein-Main airport and the center of the international finance hub: The 4-star Mercure Hotel Frankfurt Airport has 150 rooms with air-conditioning and free WIFI. Our CCH-certified hotel with seven air-conditioned conference rooms is ideal for your business and private events with up to 180 participants. The shuttle service will take you between the hotel and airport, which is 1.9 miles (3 km) away. Frankfurt main train station is 12.4 miles (20 km) away. By car, take the A3 highway. Jet off, touch down and be successful - Our 4-star Mercure Hotel Frankfurt Airport is located right by the largest airport in Germany and is perfect for your business trip or business event. Meeting facilities for your corporate and private events for up to 180 people. S8 : S8 FRANKFURT AIRP. At the 4-star Mercure Hotel Frankfurt Airport, you can choose from Standard and Privilege Rooms. Our Twin Rooms provide you with two separate beds and all the comfort of our Standard Rooms. All 150 rooms are air-conditioned and have free WIFI. If you are planning to visit us with your family, we recommend our spacious Family Rooms, in which two children up to the age of 12 can stay free of charge. Your pet is also welcome at the hotel (for a charge of EUR 12 per night). New York, our restaurant, opens daily from 6am to 10pm serving exquisite Mediterranean dishes. Come and enjoy these gastronomic delights while relaxing on our sunny terrace. We have a special menu for children. In the "Zeppelin Lounge" there is space for 40 people to sit in pleasant surroundings, so why not enjoy your favorite tipple, sit and socialize with other hotel guests or just relax in the friendly atmosphere. Open daily until midnight.